← RECOMMENDED: Pamukkale 2010 Kalecik Karasi, Denizli, Turkey. 13% ABV. 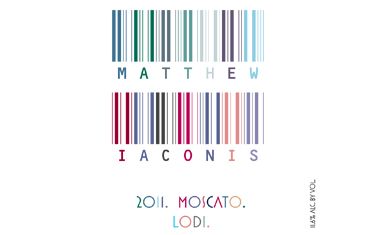 HIGHLY RECOMMENDED: Matthew Iaconis 2011 Moscato, Lodi. 11.6% ABV. $11.99. MAN. This will have to be one of my Wines of the Year. Absolutely fantastic. Roses, roses, and linden — perhaps the most aromatic wine I’ve enjoyed all year, with a taste that lives up to the aroma. A touch of sweetness but not an over-the-top California Moscato at all. SO well balanced, and still delicious and consistent three nights after opening. (Love screwcaps for reliability.) It’s so bloody well balanced that I ought to buy a case and keep it in-house as a special treat for company. Yes, it’s that good. WEB: www.NakedWines.com, a wine club. Available for $11.99, or $6.99 if you become an “Angel” (sponsor of new winemakers, $40/month membership). This entry was posted in California, Moscato/Muscat, Uncategorized. Bookmark the permalink. 2 Responses to HIGHLY RECOMMENDED: Matthew Iaconis 2011 Moscato, Lodi. 11.6% ABV. $11.99. I also loved this wine, but I went to order more and they’re sold out! Can you recommend anything similar? Is there another moscato that you would recommend? Thanks! Hi, Stephen, Try contacting the Angel Wines customer service. Their orders page has a glitch that occasionally reports wines as sold-out when they’re not. Could also google “Matthew Iaconis” or check wine-searcher.com.